It is believed that Glenn Curtiss saw his very first motorcycle at the 1901 Pan Am Exposition in Buffalo, NY. He was so inspired that he made is own machine, the Hercules, a short time thereafter with help from his wife’s uncle, Frank Neff. Uncle Frank was experiencing a bit of fame himself having recently invented the wire hood for capping champagne bottles. After patenting his invention worldwide, he started manufacturing the hood and had a plant filled with machine tools that helped Glenn refine his motorcycle engines. Engine #3 was the charm, and he based his formula for all future success on it: maximum horsepower with minimal weight – a formula from which he never wavered throughout his life. 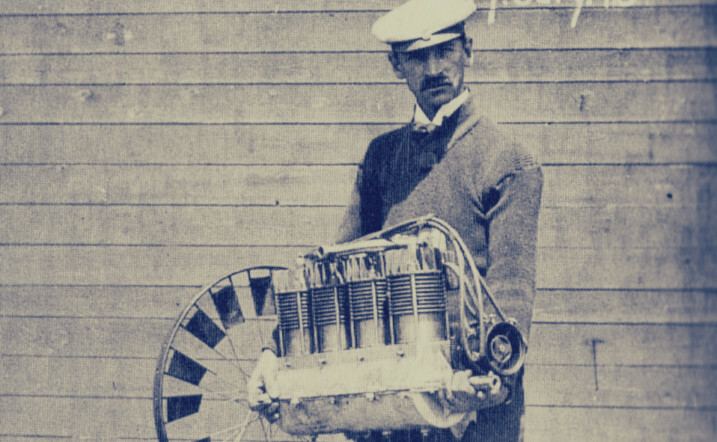 As a newly married man, Glenn Curtiss had to get very serious about making a living to support his family. With the success of Engine # 3, he opened up store branches around the region and was overwhelmed by his almost instant success. One of his earliest successes was reported in the Hammondsport Herald in 1902: “Glenn H. Curtiss received a special delivery registered letter, the first ever received in the Hammondsport office.” Items like this captured the fancy of the region, and are indicative of his rising stature. In order to keep up with product demands, Curtiss had to buy more equipment and hire more people, and like any growing business, he found that the G.H. Curtiss Manufacturing Company was strapped for cash. He made an appeal to family and friends, but the first to step forward was a local wine financier, J. Seymour Hubbs. He was followed by Victor and Lynn Masson, sons of Jules Masson who had introduced champagne (sparkling wine) making into Pleasant Valley, NY. The village mayor and postmaster, George Keller, was also a charter investor. The town’s leading attorney, Monroe Wheeler, gave Curtiss access to his stenographer and typewriter, which allowed him to issue a product catalog, take orders, and arrange shipments as far away as California. As Curtiss’ fame and success grew, he never forgot these risk takers who believed in the future and in him. December 1902 saw another first for Curtiss. He traded one of his Hercules motorcycles for a steam-propelled automobile, which made him the first car owner in Hammondsport. He described it as “a very swift machine and one of the best makes on the market.” Overnight, Curtiss was hooked on cars and actually owned several car dealerships in Hammondsport. With business taking up so much of his time, Curtiss started feeling very restless and longed for the speed of the racetrack. On Memorial Day of 1903, Curtiss entered the New York Motorcycle Club meet at Riverdale Park. He was a relative unknown outside of Hammondsport and was up against real professionals who were considered the best in the nation. Curtiss was glued flat to the frame of his motorcycle as he roared across the finish line just seconds ahead of the “best” rider and got a gold medal for his efforts. But the day was not over. He took off after that race for the National Cycle Association tournament that was taking place a few miles up the river in Yonkers. Three important things happened: he won the 10-mile event; he became the American motorcycle champion; and he set a world speed record of 56 2/5 seconds for the mile. Unfortunately, his victories were overshadowed by personal losses. His beloved Grandmother Ruth took a fall down the cellar stairs and died just a few days later from a brain concussion. Just prior to that, his father-in-law passed away, so Glenn and Lena invited his mother-in-law, Jennie, to join them at Castle Hill, which Grandmother Ruth had left to him along with the grounds and the vineyard. Once Jennie moved in, Lena was able to devote her time to helping Glenn with the business, just about the time things literally started looking up.